Nioxin Cleanser System 5 150ml – Moisturise and cleanse your head and scalp for thicker looking hair. Nioxin Scalp Revitaliser System 5 150ml – This soothing conditioner helps to provide hair resilience and control moisture balance. 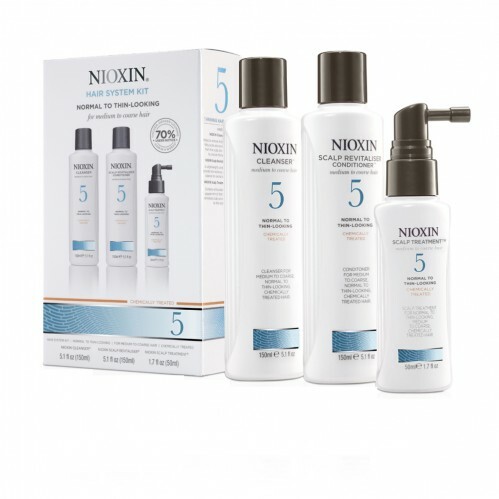 Get the thick hair you want with Nioxin Trial Kit System 5 with a transactive delivery system that cleans away the residues from you scalp, Smoothplex which helps with moisture balance and Glyco shield which helps provide protection and moisture your hair. * Applies to System Kits only. Open to UK residents aged 18 and above. Nioxin are so convinced you will love this product they are offering you a 100% money back guarantee if you are not satisfied. For further details please refer to the pack.